In Part 3 of this blog series, I briefly discussed how to interpret the suggested datasets, and how to determine if climate conditions are ‘wetter’ or ‘drier’. Two questions remain to be answered, which include identifying those hazards and hazardous events that would be affected by ‘wetter’ or ‘drier’ conditions, and how these conclusions can be incorporated into the WSP process. 1. How do I identify & assess hazards and hazardous events impacting my water utility? Table 1 shows examples of how previously identified hazards and hazardous events were categorised into the above four categories. 2. How do I incorporate this into my water safety planning? After the WSP team has done the analysis to determine if conditions are ‘wetter’ or ‘drier’, these findings need to be incorporated into their WSP. The current risk rating of each hazard and hazardous event has to be known, this can be retrieved from the water utility’s current WSP. Table 2 below indicates the current risk for ‘lower lake and reservoir levels’ which are associated with ‘drier’ conditions.  In order to determine how hazards and hazardous events would be affected by climate change, two matrices were developed, including a ‘likelihood change factor matrix’ and a ‘severity change factor matrix’.  These matrices are used to indicate by how much the risk rating and risk score for hazards and hazardous events may change under the influence of climate change. The change factors and their application were developed for the purposes of the guidance document. 5 out of 12 months had rainfall that exceeded the average/mean. 7 out of 12 months had rainfall that were below the average/mean. 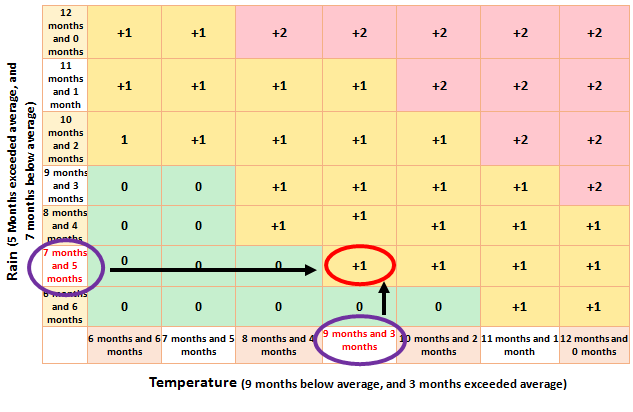 3 out of 12 months had temperatures that exceeded the average/mean. 9 out of 12 months had temperatures that were below the average/mean. Using the above information, the WSP team can determine the change factors for likelihood and severity using the below tables 3 & 4. 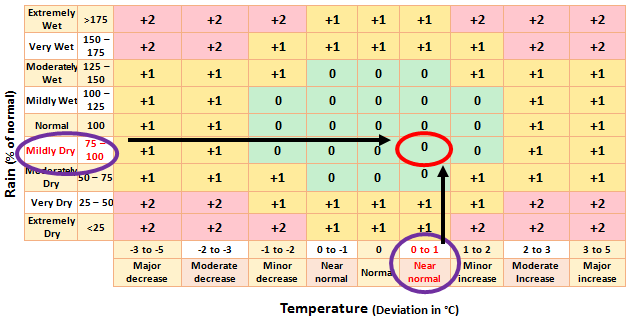 The change factors determined using the above matrices should be added to the current risk scores (Table 5). 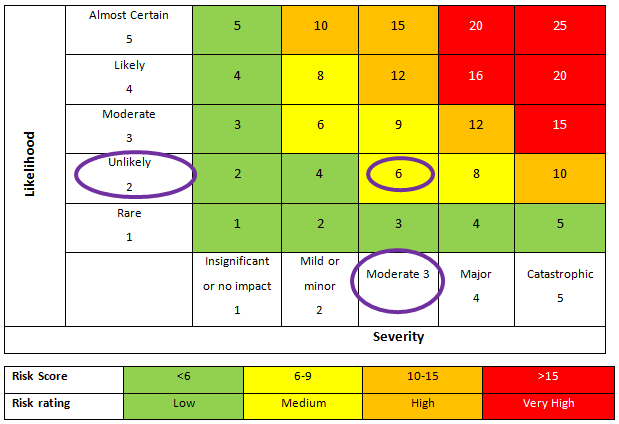 The new risk score can be put into the WSP risk matrix. This will indicate how the risk score and rating have changed. These change factors should be applied to each hazard and hazardous event affected by the associated physical condition. 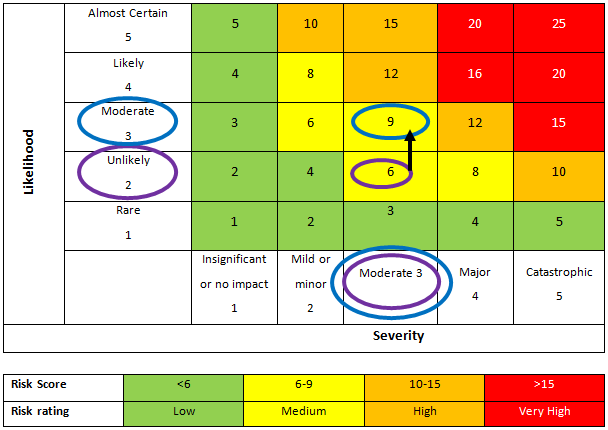 The risk score has increased from 6 to 9 the hazard and hazardous event (Table 6). 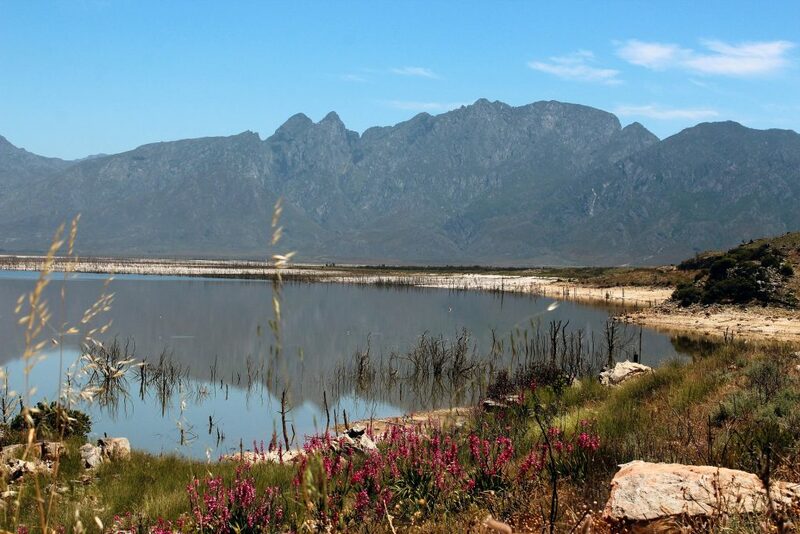 The change in the ‘new’ risk score and indicates that the effects of the hazard and hazardous event may have worsened under the physical conditions, and the water utility may have to consider taking action to limit the impact thereof.